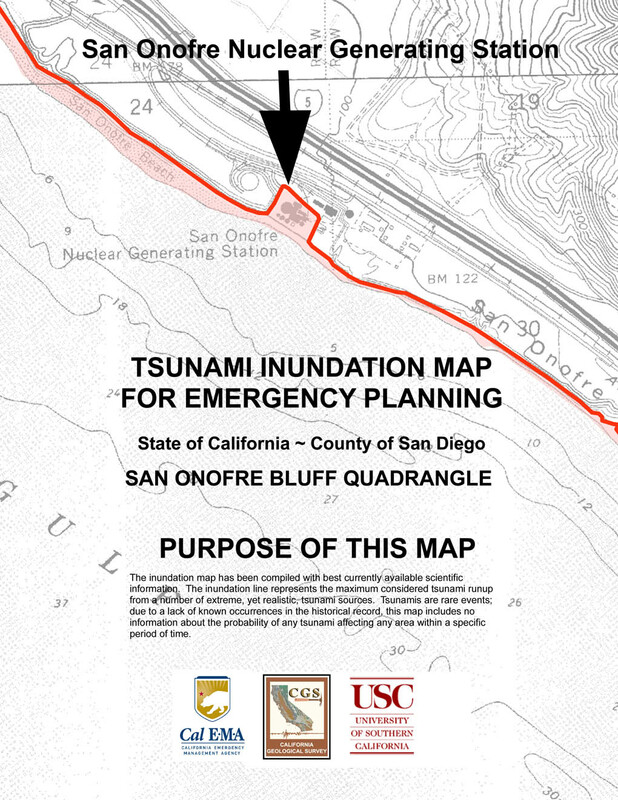 San Onofre sits within a tsunami zone. See Tsunami Inundation Map below. The California Coastal Commission (CCC) considers tsunami risks when issuing coastal development permits. See April 2011 CCC’s report The Tohoku Tsunami of March 11, 2011: A Preliminary Report on Effects to the California Coast and Planning Implications. This report was not available at the time the San Onofre permit was issued. The Nuclear Regulator Commission does not require tsunami studies for license renewal. San Onofre was originally licensed to shut down in 2013, but was extended to 2022. The plant was designed in 1973 for a 40 year lifespan. 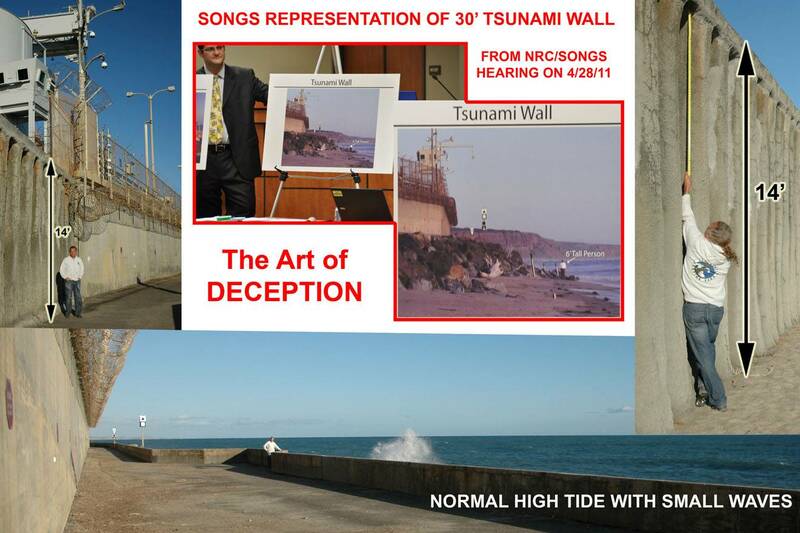 San Onofre’s tsunami wall is only 14 feet above high tide. Mark Legg, geologist and president of Legg Geophysical, appeared at a September 2011 CSU Fullerton Department of Geological Sciences seminar as a guest speaker for a lecture titled Tsunami Hazards in the South Coast Region. In regards to earthquakes, the size of the tsunami depends on the earthquake magnitude, and these usually come from big thrust faults, Legg said. But in Southern California we don’t have that (big thrust faults), but that doesn’t mean we don’ have dangerous tsunami faults,Legg added. Most damaging tsunamis are caused by earthquakes of magnitude 7 or higher. Legg said if there was an earthquake of magnitude 9 in the Aleutian Islands or in Samoa, the energy of the tsunami would be strongest traveling to San Diego in comparison to zones like Japan, the western coast of South America and parts of the eastern coast of Asia. But you can’t outrun a tsunami, Legg said. The best method of surviving a tsunami is evacuating the beach city within two to three hours of the quake, even if the epicenter of the earthquake is not where you’re located. When it starts getting knee-deep, which is a half a meter roughly, that’s when it starts to become potentially deadly, and if you add a bunch of debris, it’s even worse, Legg said.